Freedman Seating Co. Receives Morgan Olson “Presidential Circle” Award of Excellence. 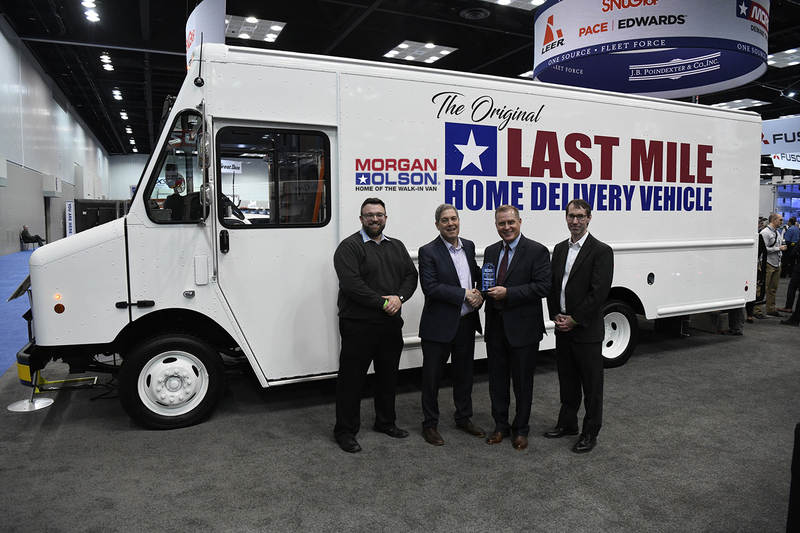 Chicago, IL: Freedman Seating Company was honored recently with the “Presidential Circle” award presented by Morgan Olson during the 2019 NTEA Work Truck Show in Indianapolis, Indiana. The “Presidential Circle” award recognizes supply chain members who’ve provided “best-in-class” supplier support and that exemplify Morgan Olson’s mission statement of “Quality…On-Time, Every time”. Freedman Seating provides a great product and service to Morgan Olson. Our walk-in step vans deliver packages and services for the largest package delivery companies in the world and when we have a supplier like Freedman Seating, it makes our product better. Freedman Seating works very closely with our team members to ensure our production lines have everything we need to produce and deliver our work trucks as efficiently as possible at the highest level of quality,” shares Dan DesRochers, Morgan Olson COO. “On behalf of all Freedman Seating employees, we are thrilled to receive this award”, says Matt Pollard, Freedman Seating OEM Sales Manager. “It’s an honor to be a part of Morgan Olson’s success”. Pictured left to right: Matt Pollard – OEM Sales Manager, Freedman Seating; Dan Cohen – President, Freedman Seating; Dan DesRochers – COO, Morgan Olson; Scott Snyder – Director of Supply Chain, Morgan Olson. About Freedman Seating: Freedman Seating is a seat manufacturer in Chicago, IL; designing, engineering, and manufacturing seat related products for many different markets, including small bus, mid-size coach, heavy-duty transit, rail, marine, delivery truck, and para-transit. Freedman Seating is a ISO 9001 registered company with an on-site A2LA Accredited Mechanical Testing Lab. About Morgan Olson: Morgan Olson is the leading walk-in van body manufacturer in North America producing over 7,500 vehicles annually. Morgan Olson’s portfolio of customers serves a multitude of industries and delivery applications. The primary industry served by these iconic Morgan Olson Walk-in vans is parcel package pick up & delivery because a Morgan Olson Walk-In Stepvan delivers most everything ordered online. Other key industries serviced include Textile Rental and Laundry services, baking and snack foods, newspaper delivery, service & utility vehicles, and the ever-growing mobile cuisine food trucks! For more information about Morgan Olson, walk-in step vans visit www.morganolson.com.